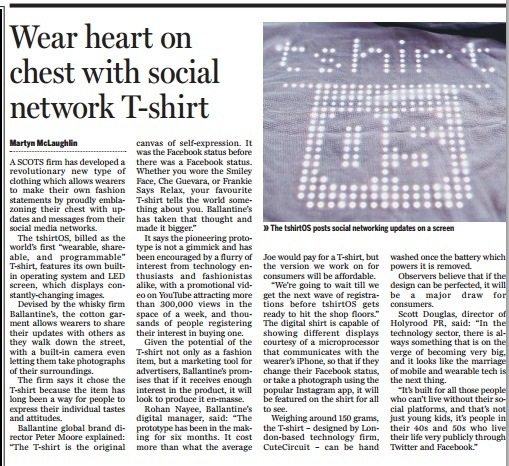 The Social Network T-Shirt – A Scots firm has developed a revolutionary new type of clothing which allows wearers to make their own fashion statements by proudly emblazoning their chest with updates and messages from their social media networks. The tshirtOS, billed as the world’s first “wearable, shareable, and programmable” T-shirt, features its own built-in operating system and LED screen, which displays constantly-changing images. Devised by the whisky firm Ballantine’s, the cotton garment allows wearers to share their updates with others as they walk down the street, with a built-in camera even letting them take photographs of their surroundings. It says the pioneering prototype is not a gimmick and has been encouraged by a flurry of interest from technology enthusiasts and fashionistas alike, with a promotional video on YouTube attracting more than 300,000 views in the space of a week, and thousands of people registering their interest in buying one. Given the potential of the T-shirt not only as a fashion item, but a marketing tool for advertisers, Ballantine’s promises that if it receives enough interest in the product, it will look to produce it en-masse. Rohan Nayee, Ballantine’s digital manager, said: “The prototype has been in the making for six months. It cost more than what the average Joe would pay for a T-shirt, but the version we work on for consumers will be affordable. “We’re going to wait till we get the next wave of registrations before tshirtOS gets ready to hit the shop floors.” The digital shirt is capable of showing different displays courtesy of a microprocessor that communicates with the wearer’s iPhone, so that if they change their Facebook status, or take a photograph using the popular Instagram app, it will be featured on the shirt for all to see. Weighing around 150 grams, the T-shirt – designed by London-based technology firm, CuteCircuit – can be hand washed once the battery which powers it is removed. Observers believe that if the design can be perfected, it will be a major draw for ­consumers.